I started going to these ladies in January of 2013 when I came over on a study abroad to London. I was an undergraduate student living in the USA before I came over. I was so happy to have met these ladies. Both did a fabulous job with my hair every time. I came back to the U.K in 2015 to complete my Masters and even though I'm in Birmingham now I still take the train to London to have my hair done. These ladies are now like family and I love how professional and welcoming they are. Simply the best!!!! I have been having my hair done by these two fantastic hairdressers since I was 7. I would only ever go to them and they take such fabulous care of my hair. If you want life long great hair go to A&J's. Jean has been my hairdresser for many years & my hair always gets compliments & I share my secret! 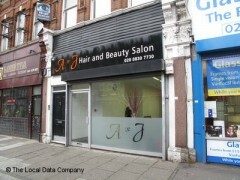 I would 150% recommend A&J for Afro-Caribbean hair care with a difference. Arnel & Jean are both professional and competent hairdressers that will make you feel very special & you will keep going back for more!!! !